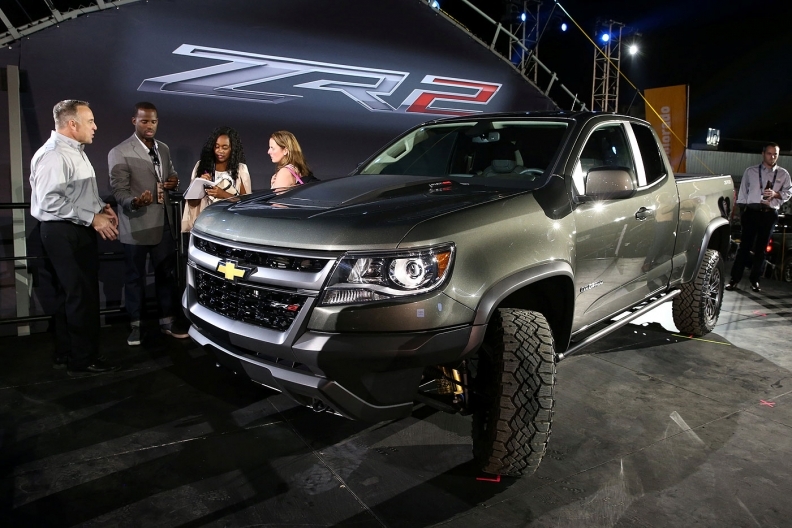 The ZR2 has a 3.5-inch wider track than the standard Colorado and a lifted suspension. Modified bumpers give the truck better off-road clearance, while functional rockers improve handling over rocks and other obstacles, Chevy says. LOS ANGELES -- Chevrolet hopes to take advantage of surging demand for midsize pickups with an off-road, high-performance version of the Colorado. Chevy unveiled the Colorado ZR2, touted as having the most off-road technology of any vehicle in its segment, at a private event ahead of the Los Angeles auto show. The ZR2 has a 3.5-inch (nine-centimetre) wider track than the standard Colorado and a lifted suspension. Modified bumpers give the truck better off-road clearance, while functional rockers improve handling over rocks and other obstacles. Chevy did not give details about market launch or pricing for the 2017 truck. The ZR2, visually similar to a concept version shown here two years ago, builds on the Colorado’s momentum at a time when sales in the segment are up 25 per cent this year. That compares with a gain of just 2.4 per cent for full-size pickups this year through October. U.S. sales of the Colorado, up 29 per cent, and its GMC sibling, the Canyon, up 21 per cent, account for a large portion of the segment’s gain. Chevy says fewer than 8 per cent of Colorado buyers previously had a full-size Silverado, suggesting that its sales have been overwhelmingly incremental to the brand rather than cannibalizing a more expensive and undoubtedly more profitable product. More than 50 per cent of buyers are new to Chevrolet, said Alan Batey, General Motors’ president of North America. Batey said the vehicles most commonly traded in for a Colorado are the Ford F-150 and Toyota Tacoma, but that many buyers previously drove cars and never owned a pickup before. 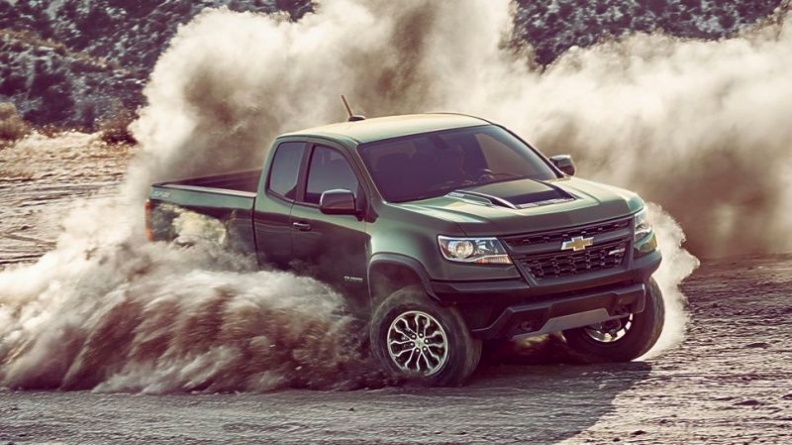 To develop the Colorado ZR2, Chevy built new off-road test areas at GM's proving ground in Yuma, Ariz., including high-speed desert sand trails, low-speed loose river-rock crossings and steep hills. Chevy partnered with Multimatic Inc., the Ontario motorsports company that’s building the GT supercar for Ford Motor Co., to create the ZR2’s dampers. The ZR2 will be the first use of Multimatic dynamic suspensions spool valve dampers in an off-road vehicle. The technology, previously used on the 2014 Camaro Z/28, enhances ride and handling performance both off road and on, while offering increased precision and manufacturing repeatability, Chevy said. Chevy said the ZR2 shares powertrains with the standard Colorado and will be available in nine drive configurations. It can tow 5,000 pounds (2,268 kilograms) and has a 1,100-pound (500-kilogram) payload capacity. 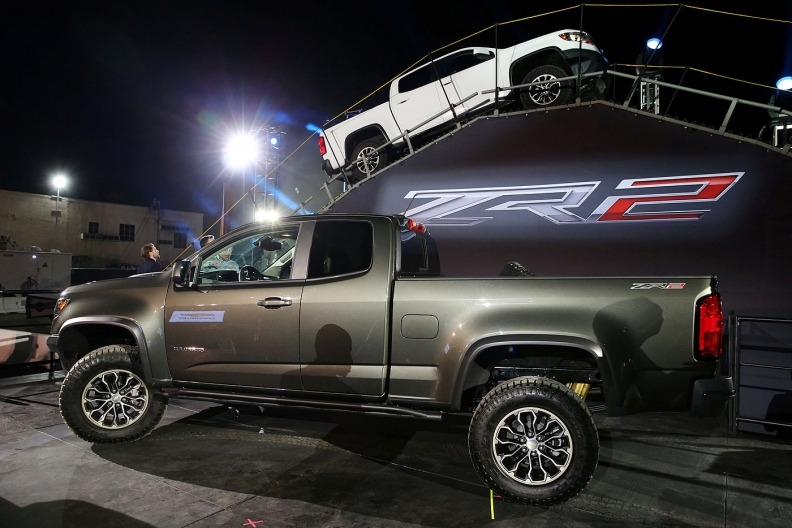 To develop the ZR2, Chevy said it created new off-road test areas at GM’s proving ground in Yuma, Ariz., including high-speed desert sand trails, low-speed loose river-rock crossings and steep hills. The truck’s components also were tested in Moab, Utah, and the Rubicon Trail.